Mongla can almost be described as Myanmar’s sin city with its casinos, neon lights and a flourishing trade in wildlife. Half the fun of travelling is in exploring small towns and checking out the local markets. However, the market at Mongla was one place I didn’t want to be. I left as soon as I saw some of the things for sale. To be fair, I had heard about it, and had been warned, but I was still curious. Such a sad sight caught my eyes. Live bears in tiny cages, parts of dead bears on tables, crates of snakes, rabbits, pangolins, etc. I am glad I left as later on my friends saw a bear being slaughtered. Having started on the negative side, I can now say that the rest of my visit to Mongla was less depressing. Mongla (Mengla, Monglar) is capital of Special Region Number Four in the eastern Shan State of Myanmar. It is a border town that neighbours China’s Yunnan Province. Because of its close proximity to China, it has a completely different feel from other parts of Myanmar. Nicknamed the City of Lights, it is connected to the outside world by the Internet and mobile phones. Cyber cafes are common enough but when night falls, the neon lights come alive to advertise the entertainment on offer, such as casinos, bars, karaoke and discos. These places are mostly frequented by the Chinese. I was surprised at how busy the border was, considering there hadn’t been much traffic on the road between Thailand and Mongla. As it turned out, many Chinese tour buses crossed in and out at the border. Casinos are the main draw, but the wildlife markets in Mongla also have a wide appeal. Mongla is well known both as a symbol of the struggle for autonomy in Mynmar and for casinos and other businesses including drug trafficking. It is controlled by the local ethnic Wa group who once fought against the Yangon troops. The city is said to be built on drug money. In the 1990s, it was a boom town with the casinos frequented by Chinese citizens living and working there, but that business died when the Chinese left. In recent years, however, business has picked up again. Shops have reopened, the red light district is more alive, and there is more of a buzz in the atmosphere. In addition to the visitors from China, there are some who come from Mae Sai, Thailand. As an ordinary tourist, I saw no sign of internal problems. Nowadays, you see more Chinese than local people. The main currency used in town is the Chinese Yuan. You almost forget you are still in Myanmar. The town is quite new. It seemed very developed after the eastern part of Myanmar that we had just seen. We saw new buildings under construction. The town was also quite busy with traffic. There were plenty of vehicles associated with the United Wa State Army. In stark contrast to these were the tour buses, and then there were the 14-ton Chinese cargo trucks that passed through. With the ever increasing trade between China and South-East Asia, the traffic on the road has drastically increased. The eastern Shan State and also northern Laos have seen a huge increase in the number of trucks passing from China’s Yunnan Province down to Thailand. This means that the shops in Mongla are stocked with Chinese goods. Apart from shopping, there are few tourist attractions in the town. 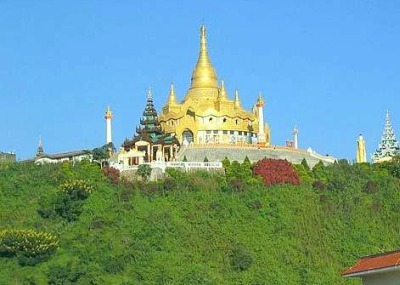 A big golden temple with a large standing Buddha is situated on a hill overlooking the town. There is an anti-narcotics museum which features exhibits on the burning of the poppy fields and destruction of the opium refineries, and tells of the government’s attempts to stop the drug trade. 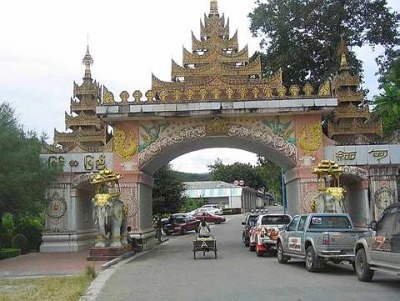 There are several pagodas dotted around the town, and as you head for the border — a mere 1.5km away — you’ll find a large decorated entrance arch that was opened in 1994. A line straddles the road marking the border and tourists pose for photos with one foot in Myanmar and the other in China. Casinos are a big draw the world over. The ones in Mongla have had an up-and-down ride. They were bustling in the 1990s, then by about 2005, they were closed down by China. A year later they reopened, and Myanmar’s Las Vegas was once again in action. However, most of casinos are now at Wan Hsieo, which is 16km southwest of Mongla. These days the casinos are losing out again because the Laotian town of Boten in Luang Nam Tha province is capturing the market. Boten is a border town with Mohan in China. I was told that the Wan Hseio casinos are now frequented by young Laotians who go there to learn the casino trade. The drawback to having new roads connecting countries is that there is an increase in trade in illegal wildlife. Sadly, more and more rare and endangered wild animal and plant species are being poached in Myanmar and openly sold in Mongla or are sent through into China. With the easing of border restrictions, businessmen and customers can easily pass across plying their trade. TRAFFIC and the World Wildlife Fund have been monitoring the situation for years, but it is very hard to enforce laws. Mongla is a strange place, very un-Burmese in character. As soon as you leave, you feel like you have returned to the real Myanmar. Driving through the eastern Shan state towards Kengtung and Mae Sai, you pass ethnic villages . . . but that’s another story. Mongla is 85km from Kengtung, in the eastern Shan State of Myanmar. It borders China’s Daluo port in Xishuangbanna, Yunnan Province. There are several tour companies running tours from Mae Sai in Thailand, through to Mongla and back. They will also arrange a 14-day permit. Travel for independent tourists is not easy. Depending on the political situation, it may be possible to travel by shared taxi or pick-up truck from Kengtung to Mongla and back. But you need a proper visa for this, not the 14-day permit. And you will have to visit the immigration department in Kengtung where you will be issued with travel papers and have to leave your passport. Upon your arrival in Mongla, a taxi will take you to another immigration unit for paperwork. And it is compulsory to have a guide. You also have to pay the guide fees by the day, and normally also for his hotel accommodation and meals. There are a few hotels in Mongla and several restaurants, all serving Chinese food. The Myanmar embassy in Kuala Lumpur is located at 8C, Jalan Ampang Hilir (Tel: 03-4251 6355).